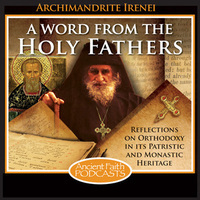 In this week’s broadcast, Archimandrite Irenei examines three sayings by Abba Poemen ("The Shepherd") of Egypt on the means by which the hardest heart can be softened by the Lord. I should like this week to offer up a few sayings, three sayings, from our father among the saints, Poemen the Great, Abba Poemen of the desert. Last week, we looked at a few of the words of St. John the Dwarf of Egypt, and we carry on this theme of the desert fathers today with the words of St. Poemen, one of the greatest elders of the Christian desert, and one for whom we have a great multitude of sayings recorded in the collection of the Sayings of the Desert Fathers, the Apophthegmata Patrum. A brother asked Abba Poemen, some brothers live with me. Do you want me to be in charge of them? The old man said to him, no, just work first and foremost, and if they want to live like you, they will see to it themselves. The brother said to him, but it is they themselves, father, who want me to be in charge of them. The old man said to him, no, be their example, not their legislator. In the Christian life, we are always filled with this great and burning question. How are we to guide others, to lead others, to be a light to others in the Christian life? For nothing less than this is commanded of us by Christ who said that he gave us light not that we are to hide it under a lampstand under a bushel, but to set it up atop the stand, that all may see it and have their paths guided by it. Leading a life turned totally inward is simply not an option for the Christian person, and yet we always ponder, for it is good that we always should ponder, how we are to live out this commandment in the world around us. How are we to be these examples, these lights that Christ has called us to be? How are we truly to lead, to influence others, to show them the light of Christ? Abba Poemen makes it explicit. We must exemplify this life. Those who wish to follow will see this light shining forth from us, will see the life of Christ being lived, and this will be of influence far more than any word we may utter, than any advice we may give, than any direction that we may propose. We are to be examples of Christ’s life. Which means that first and foremost: we are to live Christ’s life. As Abba Poemen said, you work, do your work first and foremost. And we must remember that the work of the monk in the desert was to live the life of Christ. And so it is our work in the world, and this is our first and our foremost aim for if we do this well, the grace of God, then we can be not the legislator, the leader, the teacher, the instructor, the guide of our brothers and sisters, but to some small measure, as God counts us worthy in his mercy, we may become examples of his love and his life. How do we do this? It will not surprise us at all that Abba Poemen does not simply utter advice without practical instruction to go along with it. Take for example a saying that comes just a few numbers later in his collection, Saying 177. Abba Poemen also said, “Wickedness does not do away with wickedness. If someone does you wrong, do good to him so that by your action you destroy his wickedness.” Our work is to live the life of Christ. This is how we become examples to our brethren, and the life of Christ is not simply a life of piety, of devotion, of singing hymns, of standing vigil. All these are important, but the life of Christ is often the much more difficult, the much more challenging call: to love where no love is shown, to forgive where hatred reigns, to show compassion and genuine care in the face of despisal, of persecution, of scoffing. These are the steps to the Christian life. These are the ways into the kingdom of Christ. And these are, as it were, the sparks that ignite that lamp that Christ has given us to shine into the world. If we are to help our brother, to guide them as Abba Poemen’s disciples so desired, let us begin that task, that high calling, by learning to love not just our friends, but our enemies. By learning to forgive, to render good when only evil is done to us. Let us learn to repent, to offer our hearts in joyful compunction to the Lord who has fashioned us. And by these measures, by these practical steps, the hardness of our heart, the darkness of our heart, that which is the baskets under which we normally hide our lights is not hidden by some external force. It is hidden by the darkness of our own hearts. This can be gradually worn away. The hardest heart can be softened. And on this, Abba Poemen has advice and a word as well. Here is Saying 183. Abba John who had been exiled by the Emperor Marcian said: we went to Syria one day to see Abba Poemen, and we wanted to ask him about purity of hearts. But the old man did not know Greek, and no interpreter could be found. So seeing our embarrassment, the old man suddenly began to speak in Greek, saying the nature of water is soft and that of stone is hard. But if a bottle is hung above the stone, allowing the water to fall drop-by-drop, it wears away even the hardest stone. So it is with the word of God. It is soft, and our heart is very hard. But the man who hears the word of God often opens his heart to the fear of the Lord. In this small saying, which recounts a tremendous miracle, the gift of tongues as at Pentecost, where this man of the desert, this man not of learning, but of divine wisdom, is able to speak in the language of his hearers by God’s grace. What he speaks are miraculous words indeed. The content of his speech is more miraculous than the fact that he gives it in this supernatural way. Our hearts are like a hard stone. The word of God, the commandments of God, sometimes seem soft. They flow over us like water. So many people accuse them of not having the power to change the world. These are soft words: the world needs action, needs something more fierce, something more powerful. But St. John’s words reveal a deeper truth. Water for all its softness wears away the hardest stone. And God’s creation is filled with vivid, beautiful examples of just this premise, just this reality, born out in the natural world. When we stand next to a canyon or a valley, carved out by the water, this soft stream at the bottom, which has fashioned such an immense canyon, we are reminded of the power of this soft substance over the very hardness of the rock itself, and so it is, with a darkness, the hardness of our cold hearts. However hard, however burdened by sin, the power of God will etch this away, will make a soft and fertile land out of our barren, dry, and hard hearts. It is possible, no matter what the degree of our sin, through repentance, through hearing the word of God, through coming to live the life in Christ, to become an example for the world, to become a living icon of repentance. If only we would dedicate our heart to this act. Let us then rise up. Let us flood our hardened hearts with the word of God, received through the Church, the holy mysteries, the divine Scriptures, and the voice of our Fathers. Let us struggle after the virtues despite our falls, getting back up to renewed vigor at each stumbling, making a new beginning. For Christ calls us to the heights of his glory. He will enable every man, woman, and child to take the light of his glory to set it high upon the stand of their purified hearts and shine a light out into all the world. Through the prayers of our father among the saints, Poemen of Egypt, Lord Jesus Christ our God, have mercy on us and save us. Amen.